Okay, I admit it… any children’s book that puts meditation in a good light has got to be on my list of great children’s books. 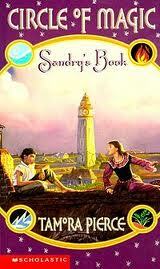 But that’s not the only reason that I loved Sandry’s Book, the first of a quartet of books called Circle of Magic. I also love it precisely because it is about magic…magic that is both ordinary and extraordinary. This book is pure fantasy, from the location to the premise, and done with great skill and care. It’s a fantasy book that is perfect for younger readers, as there is nothing scary or too out of the ordinary in it. I love that the magic comes in every day forms: weaving, gardening, metalwork, and climate. Each of the four children in this series represents one of the four elements of earth, water, air, and fire. They are apprentices, learning that they do have magic in them, and meditation is one of the ways they access their powers. The role models in the book are as compelling as the children – Niko, the mage, and the two women ‘nuns’ who become their main caretakers. This is one book I couldn’t put down till I finished, and then I went off to the library to find the sequel. I can’t wait to see how each children’s book in this series turns out (see the review here). Wonderful and delightful fantasy, with great lessons about self-control and friendship.